Priced at just $199, Amazon's new Kindle Fire meets expectations as a low-cost touchscreen tablet that works relatively well despite some quirks, though it can't compete directly with Apple's iPad. 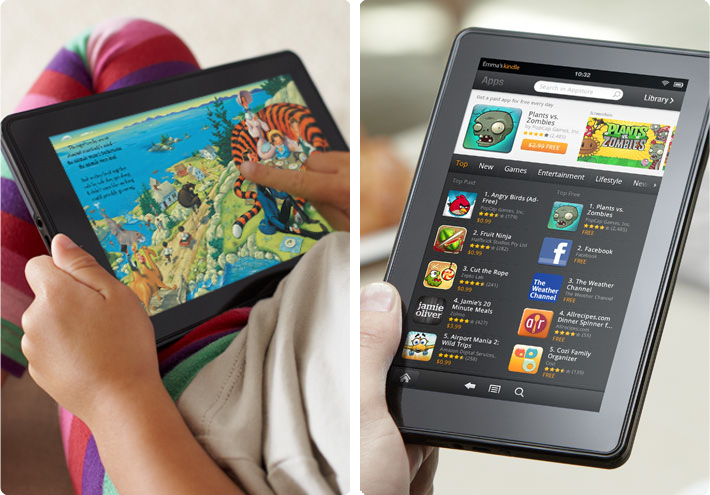 The new Amazon Kindle Fire will begin shipping to customers on Tuesday. It's the retailer's first tablet-style device with a color touchscreen, priced at less than half the cost of Apple's iPad. The aggressive price impressed reviewers, but most felt the first-generation device is lacking. Saying the Kindle Fire is like an iPad for just $200 is a "dangerous comparison," said David Pogue. He said Amazon's budget-priced tablet does not have the "polish or speed" of Apple's touchscreen tablet. "Animations are sluggish and jerky —even the page turns that you'd think would be the pride of the Kindle team," he said. "Taps sometimes don't register. There are no progress or 'wait' indicators, so you frequently don't know if the machine has even registered your touch commands. The momentum of the animations hasn't been calculated right, so the whole thing feels ornery." He said buyers might pick the Kindle Fire over the new $250 Nook from Barnes & Noble because of Amazon's selection of content, as well as its Whispersync technology and cross-platform support. Customers who buy Amazon's $80-per-year Prime membership also have access to unlimited streaming of 13,000 movies and TV shows, along with free two-day shipping on purchases. But for users who are solely looking for an e-reader, Pogue said he believes that Amazon's e-ink-based Kindles, which start at $79, are "no-brainers." As a full-fledged multimedia tablet, he believes the Kindle Fire falls short. "The Fire deserves to be a disruptive, gigantic force —it's a cross between a Kindle and an iPad, more compact Internet and video viewer at a great price," he said. "But at the moment, it needs a lot more polish; if you're used to an iPad or a 'real' Android tablet, its software gremlins will drive you nuts." Once you get past the "insanely low price" of the Amazon Kindle Fire, it just doesn't live up to the hype, Jon Phillips believes. He said its 7-inch screen is too small for most tablet activities, its performance can lag, and it lacks 3G data connectivity and a slot for removable storage. The main strength of the Kindle Fire is it's a "pretty good bargain" for anyone who is reluctant to buy a touchscreen tablet, allowing the device to enter an "impulse-buy threshold" that Apple's iPad cannot touch with its current $499 entry price, he said. He advised potential buyers to at the very least wait for a second-generation Kindle Fire, or opt to upgrade to Apple's iPad. He suggested that the current iPad 2 will be even cheaper once Apple launches a third-generation iPad, expected to debut in early 2012. "iPad killer? No, the Kindle Fire is not. And it doesn't even match the iPad in web browsing, the one area in which its hardware should have sufficient performance to compete," Phillips said. "But the press has definitely supercharged Amazon's product with a level of hype and enthusiasm that would make Apple proud." The Kindle Fire does a sufficient job of hiding the "warts" of the Google Android mobile operating system, Larry Dignan believes. But he also noticed that Amazon's tablet is just about getting users to buy more content direct from the online retailer. The new tablet requires that users live in "Amazon's world," a closed system that even prevents users from visiting the regular Android Market on the Kindle Fire's Web browser. When attempting to access the traditional Android Market, users are then sent to Amazon's own proprietary Appstore, which allows the retailer to "ensure app quality." More than anything, Dignan said the Kindle Fire is an "impulse purchase device," prompting users to buy an Amazon prime subscription, extra storage in the Amazon Cloud service, and even buy physical goods and have them shipped to your home. In that respect, he believes the device will be profitable for Amazon, even though the company is believed to be selling its tablet at a loss. He said the Kindle Fire is like an "e-commerce kiosk" that Amazon is putting in the hands of its customers, making the Amazon experience a platform unto itself. "I argue that's highly likely that there will be folks that own an iPad, a Kindle Fire and maybe a Kindle Touch. No matter how you slice it Amazon will garner more of your time. It's a store that's quickly becoming a hangout for entertainment devices. "However, the Fire isn't necessarily an iPad killer. If anything the Amazon and Apple approaches will occupy the low and high ends of the tablet equation, respectively, and crush everything caught in the middle." Other takes on the new Amazon Kindle Fire are available from Gizmodo, and Engadget, The Verge.